Lately, I’ve been a bit obsessed with companies like Under Armour and Lululemon Athletica. It kind of started in Montreal with the really amazing technical fabric (Suziplex) I got at Suzi Spandex. I made a couple of running skirts from that knit. Recently, a little pop up / showroom of Lululemon opened in Baltimore. Wile browsing thier $120 hoodies, I read in a book that the fabric they used was called ‘supplex’. A quick internet search showed that supple x is breathable, holds its shape and retains color. Now, most of these companies rebranded the name (Armour®Stretch and Luon) . But, companies like Danskin still call it supplex. While in NYC yesterday, I managed to snag some one yard cuts of supplex from Stretch House for $6 a yard. I also got several yards of the black stuff at $14 a yard from Spandex House (thicker for the bottoms). I want to make some athletic gear for biking and the occasional yoga class. 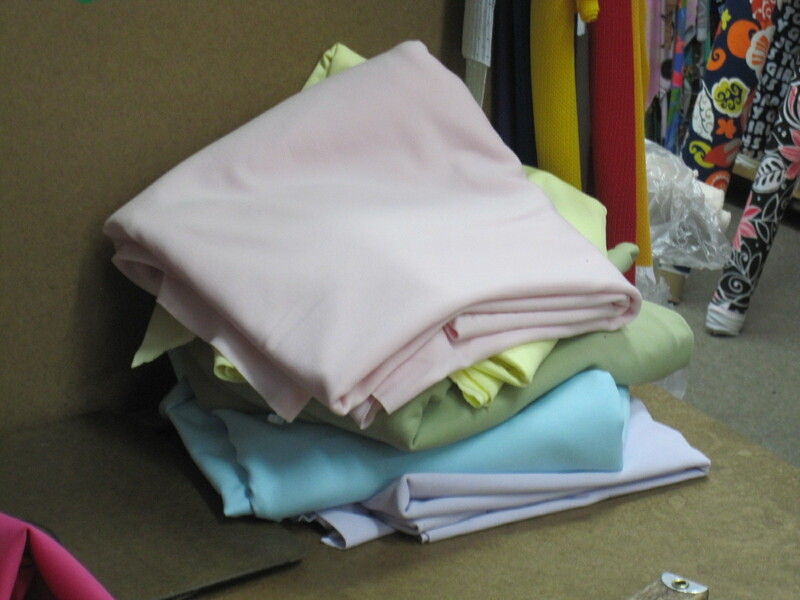 At $6 a yard for the pretty pastels, I can certainly make myself Under Armour style shirts for $10. That’s like a $30 savings! 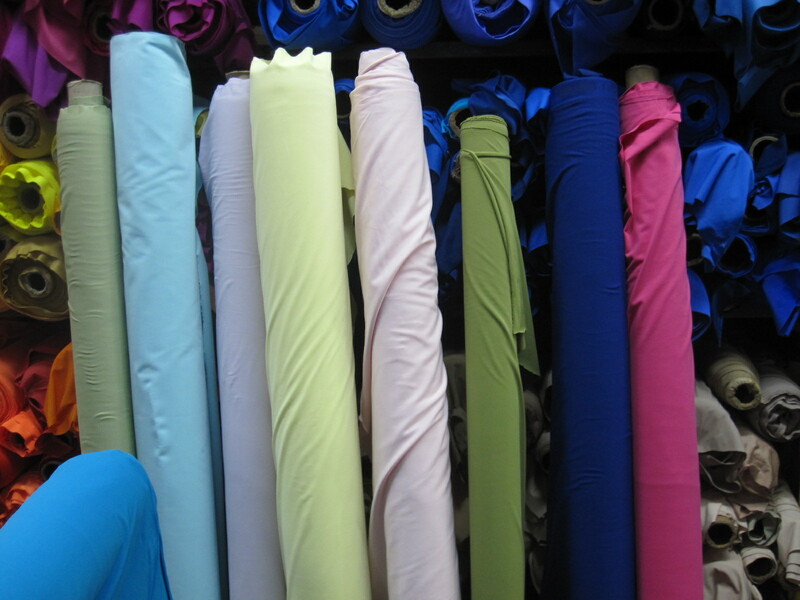 These one yard cuts are accent colors for pants and tops. I couldn’t believe how much I liked Lululemon. So much that I was seriously ready to buy a hoodie. I still might. I loved it. The pants I think I can swing. Supplex/lycra knit is my favorite for exercise gear. I buy it when I see it. Good haul! Ooooh. You’ll get lots of stylish performance gear with all that. What a score! You won’t regret it, that stuff is -not- biodegradable :-). I had to throw out my supplex jacket after 15 years of near-daily wear, not because there was anything slightly wrong with the supplex, but because I hadn’t been careful to use tough enough zippers and notions. You can sweat in it with abandon too, just wash it with a bit of borax occasionally. Unfortunately, the lycra will give out way before the supplex here, but it still should last you a decade or so, much much more than other knits. OH, and CGcouture: you can get it easily, but at outdoors shops. Look at the $2.95 sale currently on at Seattle Fabrics for instance. They really need that stuff in the NorthWest :-). Incidentally, I’ve totally switched from goretex to supplex in my outerwear, this way I may be slightly damp from rain occasionally, but I don’t get bathed in sweat any more. Interesting. I bought my first real rain jacket from LL Bean last week from their version of Goretex and ordered gobs of it from FabricMart. I need rain gear for an upcoming trip and don’t want to get stuck without waterproof pants should we ever get a crazy winter again. Cidell, you read my mind! After doing free weekly yoga exercises at the local Lululemon, I kept thinking “I’ve got to find out what ‘lulon’ (their fabric term) is.’ You did it. Supplex! I may have to see if my local Vogue Fabrics has it…if not Spandex House and Stretch House you’re next on my keyboard! Spandex House did mail samples for me so I sort of knew what I wanted. The thicker stuff seems to be what’s on their website and that’s good for bottoms. The thinner fabric and more colors aren’t on their site. But, they are cheaper and great for tops. I LOVE Lululemon. They have sucked me in with the good design and neat fabrics. They had a little book on their history and it said, “the fabric was originally called supplex”. I remember looking around the room and wondering if anyone else was going to be as excited as I was about this. Also, the Under Armour founder says the material existed before. Just no one was using it for athletic gear. Supplex. Good tip. DD wants to start wearing skirts to her skating class (DO YOU KNOW HOW EXPENSIVE THEY ARE TO BUY!!!!! ), so I’m planning on making her some for Christmas. LOL!! If it’s anything like running skirts, I believe you. I was SHOCKED when I realized that if your gear wasn’t from Target or Walmart — prices started at $30. That fabric store looks fun. It reminded me of some stores I’ve been to in Chicago which are cheek to jowl with fabric. Thanks for the heads up on supplex. My husband has asked for some running gear but I am not at all conversant on athletic poly’s, not being much on an athlete myself. I will look for it. It has been years since I bought anything remotely athletic. I didn’t even know we weren’t supposed to like cotton anymore! Snoop shopping athletic clothes has been eye opening. What great finds! Last October I made a couple of pairs of supplex workout pants that I’ve worn to death. They’re a little pilled and snagged where I’ve run into icky hiking trail weeds or the wicked side of velcro, but other than that they are good as new. Amazing fabric! Was there a reason you didn’t go to Spandex World? That’s the other stretch fabrics store I always hear about. Just curious; I’ve never been to either. 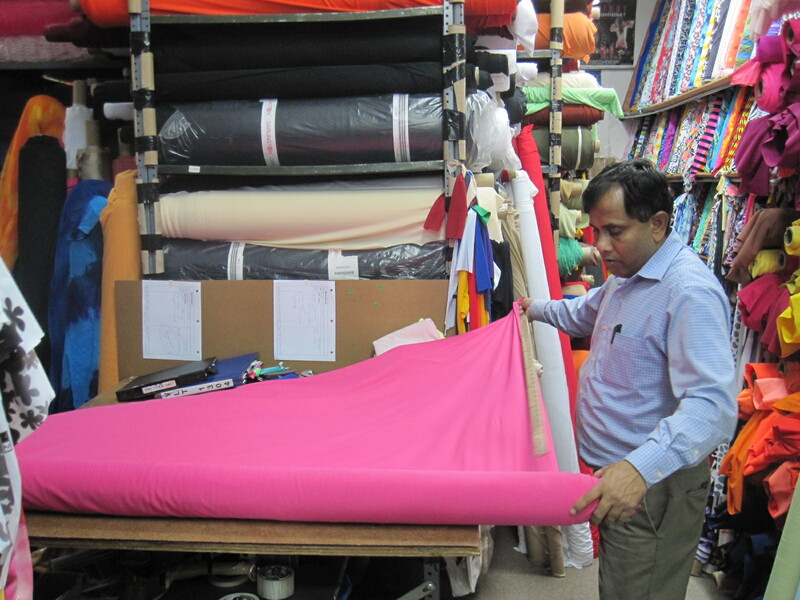 Are the stores able to tell you about the degree and direction of stretch for each fabric? I have a few pairs of Under Armour compression shorts. They’re very well made, but they’re pricey and I get tired of wearing someone’s logo all the time. If I’m remembering correctly, here was my reasoning. I like Spandex World and Spandex House for online orders. But, I *think* Spandex House was so offensively bright and tacky when I walked by I didn’t want to go in. That being said, I may have some of these confused. Stretch House on 37th was where I bought the supplex of many colors. And, wasn’t crazy tacky from the window. I like Under Armour primarily because it’s a local Baltimore company and the founder went to my college and played football with an ex boyfriend of mine (who was also in some of the commercials). But, I never bought their stuff until this year. At Zumba this week *everyone* had on UA. It sort of made me not love it as much as I had. I didn’t mind the logo. I minded that everyone had the logo. Does that make sense? Actually, when I looked at the site I realized that the Under Armour logo wasn’t all that big, compared to that of some brands. Sure, I understand why one would be turned off by being drowned in a sea of identical logos. I’d also love to be able to copy some $60 yoga pants that I bought at Paragon Sports. I think the brand is One Step Ahead. They’re my general hacking around pants. The fabric is a heathered gray, which keeps them from looking like old-lady pants. The fabric is soft and drapes well. Unfortunately it does pill after a while. Thanks for sharing your sources and inspiration. I too would like to try some exercise wear, mostly to get the fit and cute designs from the pricey stuff. I’ve been getting the Title Nine catalog for years and love the woman friendly designs they carry. So I’ll be watching and learning. Very nice! I’ve been looking for some and it’s difficult to come by. I should’ve bought some when I was in NYC in August.